With all inclusive resorts being the norm in tropical locations such as Mexico and Jamaica, we’re frequently asked, “are there are all inclusive options in Tahiti?” The technical answer is, certainly. The more thorough answer is yes, but not in the way you may be accustomed. To be clear, the travel packages you’ll find on our website do include international air, inter-island transportation, hotel stays, hotel transfers and taxes, as well as daily breakfast at the resort. However, if you’re looking for a package that also includes meals, snacks, and beverages; they do exist in French Polynesia but they are not the norm. There are a select few options designed as all-inclusive: Paul Gauguin Cruises, Aranui Tahiti Cruises, and The Brando Resort in Tetiaroa. 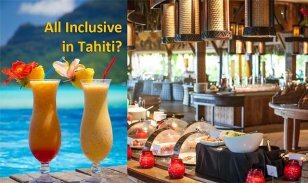 Back to the thorough answer, yes, Tahiti can be all inclusive, but not in the way you’re accustomed. While few resorts in French Polynesia are truly all inclusive, most do include the option of adding a meal plan (unfortunately, drinks are excluded) for dinner, or lunch and dinner (all packages from Tahiti Travel Planners already include breakfast). How do you decide if this is right for you? Here are some helpful tips. The most beneficial aspect of purchasing a meal plan in Tahiti is that it is convenient. You know in advance how much you’ll be spending on meals and have them paid for in advance. However; in our experience the dinner plans are priced factoring in the resort’s most expensive menu items. This makes logical business sense from the resort’s perspective, but does not offer the cost savings you may have hoped for. In many cases you’ll spend the same amount, or less, by ordering your meals ala carte. With the exception of the Brando resort in Tetiaroa, meal plans at the resorts in the Islands of Tahiti do not include alcoholic beverages. Depending on the resort, some meal plans come with a separate menu leaving you with fewer choices. That delicious looking surf and turf at the table next to you may not be available on the menu for which you’ve pre-paid. Also, consider that purchasing a meal plan means you’ll need to be at the resort for all of your meals. Tahiti, Moorea, and Bora Bora each have an abundance of wonderful restaurants at a variety of price points. All are local and use many locally sourced ingredients. No TGIFridays, etc. The food here is outstanding; most blending the access to the finest and freshest seafood with the exquisite cooking techniques of France and Europe—you won’t be disappointed! *Check out more of our favorite restaurants in Bora Bora and Moorea. Will You Get Your Money’s Worth with an All Inclusive in Tahiti? If you’re working with a reputable travel agent, they should be able to negotiate a complimentary buffet breakfast on your behalf (this is included on all Tahiti Travel Planners packages). It’s worth noting the breakfasts are usually buffet style and the selections are quite generous. This is a nice perk and can easily allow you to skip lunch, or simply enjoy a light snack in the afternoon prior to dinner. The meal plans are designed to offer three courses at lunch and four courses at dinner. We would be remiss if we didn’t point out that food does tend to be a bit expensive in French Polynesia (as with locations like New York, Los Angeles or Honolulu prices) and the resort restaurants tend to charge higher prices than what you’ll find at local eateries. That said, there are many ways in which you can save, spend more economically, and still have a wonderful trip! Aside from exploring the local food culture outside of your resort, you can also stock up on snacks at the small grocery stores on each of the main islands (Bora Bora included). You’ll find fresh baguettes, croissants, and pastries (rivaling what you’ll find in the best Parisian patisseries), cheeses, snack foods, juices, etc. at prices that are not much higher than in North America. Shopping locally for a few essential snack items is a great way to get out and experience the everyday culture of the island, and can really help your budget!